The Big Blake Project > News and Events > Bognor > We’ve done it – together! Blake's roof of rust'd gold where he saw angels and wrote Jerusalem bought for the nation. It's hard to believe it’s only just a year since the Blake Festival was held in Felpham to launch the crowd-funding side of the Blake Cottage Campaign. Prior to that, a Patron’s event was hosted by the Blake Society in the Houses of Parliament on the 7th July. 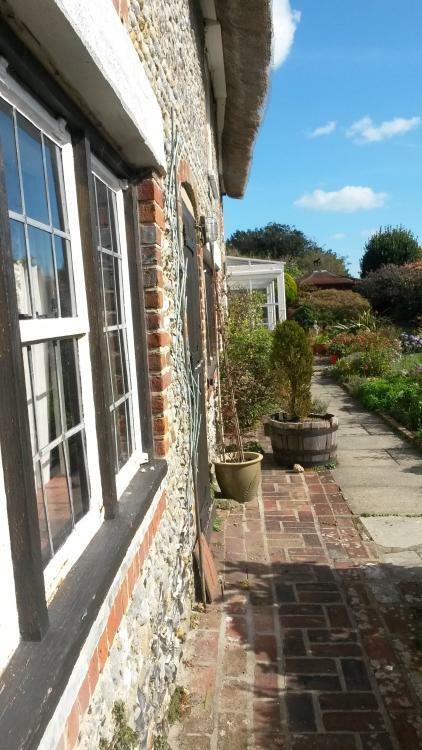 grants, writing letters and hosting original events; all held all in the spirit of chasing the dream that Blake’s Cottage in Felpham could be saved for the nation. would have been thrilled with, and probably wouldn’t have been surprised either by the more muted reaction elsewhere. In the end it was a miracle that brought Stage 1 to a conclusion – just as hopes were beginning to fade, a single anonymous donor generously provided Tim Heath Chair of the Blake Society with a giant-sized share of the purchase costs. Locals and community groups have shared the dream and although the chance of success was small, believed and gave generously anyway. The cottage as of today is in the capable hand of the Blake Cottage Trust. They have a lot to do facing urgent and serious structural issues. The local economy would benefit with the allowance of some public access to the cottage. Ideas are welcomed by the Blake Cottage Trust for how the cottage might best be used. Meanwhile the Big Blake Project team are supporting a local, educational, heritage bid to explore the area’s link with Blake, pursuing wider regeneration initiatives in Bognor Regis and hope to hold a festival again next year. The next Blake Project event will be at the Petworth Literary Festival in November.